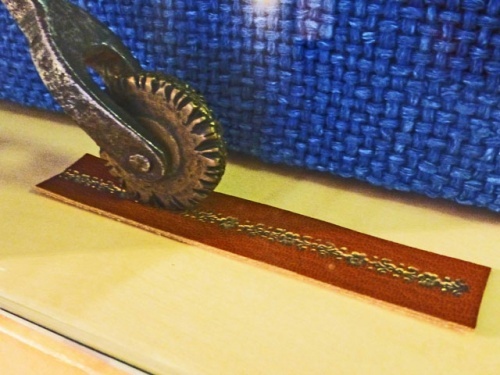 Giving leather a golden glow requires a special finish. 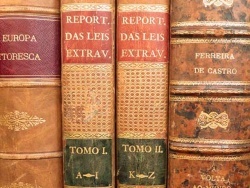 It was heavily used on leather wallpaper for royal and upper-class residences in Europe during the 16th - 18th century. 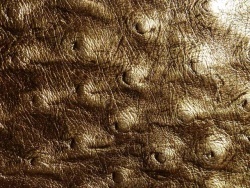 Although one could assume that the golden surface of the leather comes from a gold leaf coating, it is actually silver leaf. Nevertheless, even if not real gold, the manufacturing process is still very expensive and complex. It requires practice and patience, as well as the background knowledge, to obtain the perfect gold shimmer. A special paint based on various resins was used for this purpose and its composition was a closely guarded secret during the Renaissance and Baroque periods. 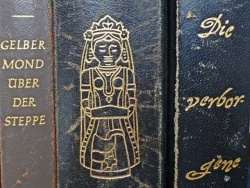 Gold leather was additionally decorated by carving, painting and embossing. 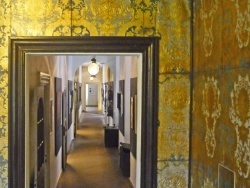 Leather wallpaper with gold leather (silver leaf with paintwork) and embossing in the castle of Jever in Germany. 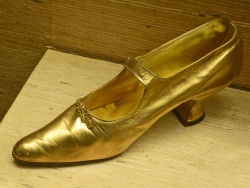 Today the tone or shade of gold leather is adjusted by dyeing or using foils. 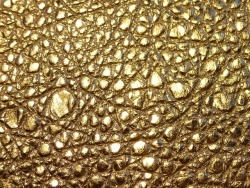 Carp leather as gold leather topped with metallic film. Leather handbag made of gold leather. 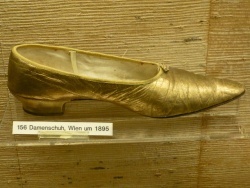 Two ladies' shoes made of gold leather from around 1895 (German Leather Museum in Offenbach). 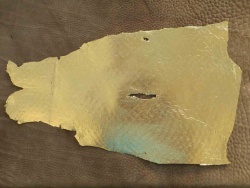 Hand gilding: This technique comes from the Islamic culture and existed way back in the 11th century, using tools to emboss the gold leaf onto the leather. It is a highly skilled technique and it is necessary to work very carefully to achieve clean transitions. 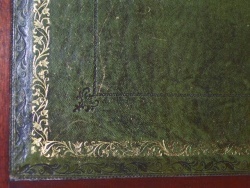 Gold print: Motifs were pre-punched, then the area had to be primed. The rest of the areas where the gold was not going to be applied were oiled so that the gold leaf wouldn’t stay. 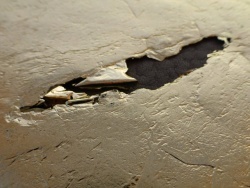 The gold leaf was applied with cotton, pressed with a heated tool and the excess was rubbed off. 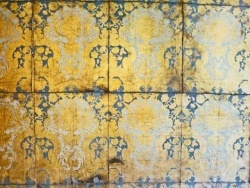 Press gilding: Decorative motifs were applied using brass plates or stamps. 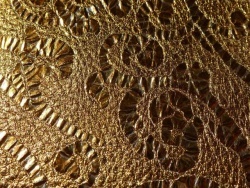 Today, long sheets of gold foil are used by machines to gold plate the leather. 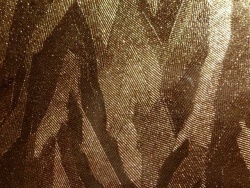 Engraving calligraphy: Transferring gold foil onto leather by hand using heat. 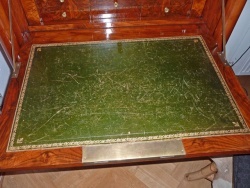 In the past, table tops made of leather were often decorated with gold borders. Tool for the application of gold stamping. Engraving gold calligraphy with heat by hand.